World No Tobacco Day. Intimidation - Stop tobacco industry interference. Tobacco giants are adopting new ways and “disguises” to push their products, noxious both for people and the environment, and interfere with government efforts to regulate the sale and use of tobacco, the head of the Secretariat of the WHO FCTC, the United Nations-led tobacco control treaty, has told UN News. The WHO FCTC, which stands for the World Health Organization Framework Convention on Tobacco Control, is the only UN global health treaty that advocates for the control of tobacco production, sale and use, to reduce its harmful impacts. According to a report by the Convention Secretariat and the UN Development Programme (UNDP), over seven million people die every year due to tobacco use. In addition, more than a trillion US dollars are spent annually in tobacco-related medical expenses and lost productivity, while the environmental degradation and pollution resulting from its production cannot be overstated. “As more and more people realize the levels of harm caused by tobacco products across the board, and how preventable it all actually is, we are slowly seeing more governments embrace tobacco control to save lives and the environment,” said Dr. Vera Luiza da Costa e Silva, the head of the tobacco-control Convention Secretariat. They are now using the tools and language of tobacco control advocates to push their dangerous agenda - Dr. da Costa e Silva, head of WHO FCTC. The UN-led treaty watchdog has been focusing on surveillance, documenting the ways in which the tobacco industry is re-branding and inserting itself in tobacco-control discussions and activities, including those related to the Sustainable Development Goals (SDGs), in order to influence decision-making. Article 5.3 of the Convention legally requires that parties to the treaty ensure that their public health policies are protected “from commercial and other vested interests of the tobacco industry”. The article is based on the idea that there is a fundamental and irreconcilable conflict between the tobacco industry’s interests and public health interests. In 2008, guidelines were developed for the effective implementation of Article 5.3, but the industry’s efforts to interfere continue too often to be successful. For example, as recently as September 2017, the Secretariat of the WHO FCTC denounced the creation of the Foundation for a Smoke-Free World, funded solely by one of the world’s top tobacco companies with close to US$ 1 billion pledged to sponsor studies on agriculture, labour and nicotine delivery products. “This is a perfect example of a seemingly harmless philanthropy, which claims complete independence, promoting tobacco-industry-funded research and attempting to influence the public debate and common knowledge on the effects of tobacco on health and the environment,” said Ms. da Costa e Silva. The Convention Secretariat stresses that many of the new products developed by the industry, marketed as “smoke-free” and “heat-no-burn”, create confusion among consumers, leading them to believe that they are safer to use, even though there is no independent research confirming it. “With their right hand, they come up with these new – and still harmful – products, and with their left hand they find ways to support studies that present them as safer for people’s health, even though there is actually no scientific evidence to support such claims,” said Dr. da Costa e Silva. The Secretariat notes that these tactics are being used by the industry on other fronts as well, such as issues like environmental degradation or child labour practices, to steer the public conversation in a direction that is more favourable to tobacco conglomerates and to prevent the adoption of effective tobacco control policies. 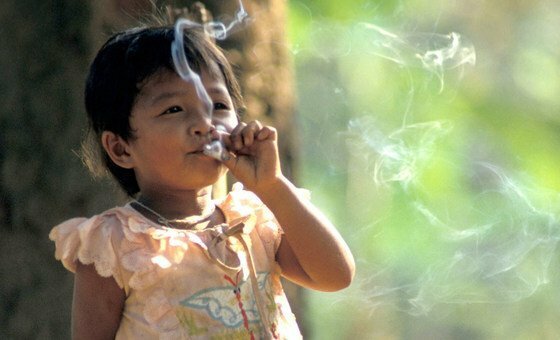 A young girl smoking. Photo: WHO/Jim Holmes. “As tobacco giants become more creative, we must not forget: the tobacco industry is the problem here, so how could it ever be part of the solution? They have their own agenda,” Dr. da Costa e Silva insisted. To prevent further interference in public health policy design by tobacco conglomerates, the WHO FCTC is encouraging governments to put tougher measures in place, in line with Article 5.3 of the Convention. Regarding the Foundation for a Smoke-Free World, for example, in January 2018, Poland’s Ministry of Health alerted all medical schools in the country, informing them that Poland is a party to the tobacco-control Treaty, and urging them not to request or accept any funding from the tobacco-industry funded Foundation. The letter warned that in future legislative work, the Ministry of Health would not accept any research conducted in cooperation with, or funded by, the tobacco industry. Viet Nam’s Ministry of Health issued a similar letter to all government ministries, and in the United States, 17 of the US’s top schools of public health announced they will not accept funding from or pursue work with the Foundation for the Smoke-Free World. “There are encouraging decisions being made around the world but it is sadly moving at an alarmingly slow pace and we cannot afford to rest on our small victories,” noted the head of the Convention Secretariat. “The industry is always catching up and finding new ways to counter our efforts,” she warned. To keep up, the FCTC Secretariat has set up seven “Knowledge Hubs” to monitor the progress made on the implementation of the treaty, including one in Bangkok, Thailand, dedicated to collecting and analyzing data to measure the progress toward making Article 5.3 a reality.